If you're looking for a fun gaming fix on the go, why not Fortnite on mobile? You can now play Epic Games' battle royale shooter on both iOS or Android devices, taking the most-played game worldwide to a wide range of pocket-sized smartphones and bag-ready tablets. Bringing Fortnite to mobile was a no brainer. The runaway success of Fortnite Battle Royale, which sees 100 players duke it out on an island map to be the last fighter standing, has already seen it come to Xbox One, Playstation 4, and Nintendo Switch. Thankfully, Fortnite's cartoonish art style also lets it downscale easily to smartphone screens, which have never been more capable of competitive online gaming – with an aim-assist option for Fortnite mobile players mourning the loss of detail at that smaller size. So Fortnite mobile is very much the real thing, and if you're reading this it's because you want to jump right in to the Epic Games mobile game. To that end, we've put together a step-by-step guide for starting your Fortnite mobile game adventure. What is Fortnite on mobile? Fortnite mobile is the full game you know and love from PCs and consoles, with the same weapons, the same map and an identical update schedule. Elements of Fortnite's UI are different on Android too, with extra building buttons popping up, and there are both on-screen footstep and gunshot indicators to tell you the direction of any nearby sounds. Other than that, Fortnite on mobile is the same game. If you're an iOS user reading this, all you have to do is head to the App Store as usual and search for Fortnite in the search bar. You then hit install and wait for the game's icon to pop up on your homescreen or list of apps. Easy, right? First thing's first: you won't find it on the Google Play Store like all your other apps. While iOS users have been happily downloading Fortnite from Apple's App Store, anyone on Android will have to find a dedicated install file on the Fortnite website. This is partially to 'build a direct relationship with players' but may have more to do with not giving Google a 30% cut on Fortnite app purchases. 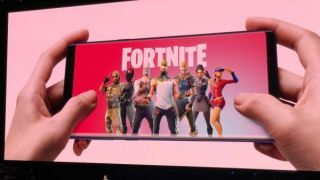 All players have to do is open an internet browser on their smartphone – whether that's Google Chrome, Mozilla Firefox, or Internet Explorer – and go to Fortnite.com/Android, where they'll find the Fortnite Installer for download. The Fortnite on Android beta saw a brief exclusivity window for Samsung Galaxy phones, with a suitably galactic skin bundled in. What devices will run Fortnite on Android? Before you go any further, it's worth checking your phone is actually compatible with Fortnite on Android. While the game has been optimized to play on mobile, older phones simply aren't up to the performance standard needed to run the game. After a brief exclusivity window for Samsung Galaxy phones, the Fortnite mobile game is open for all of the Android devices in the box, right. Why would Epic Games keep the Android version off the Play Store? Considering that Fortnite on iOS has passed 100 million downloads and cleared $160 million from in-app purchases, swerving the Play Store may prove to be a smart business decision. This was only the start, however: Epic has since launched its own Epic Games Store to offer Fortnite and more besides through its own digital marketplace. Does Fortnite mobile support cross-play? Yes – Fortnite on Android and iOS is compatible with iOS, PC, PS4 and Xbox One versions of the shooter, so you’ll be able to squad up with your friends on other platforms. Cross-play is currently available between all consoles listed above, after mounting pressure from fans convinced Sony to change its tune.